After three days of bidding, the 2016 capacity auction for the delivery year 2020/21 finally cleared at £22.50 / kW / yr, a higher price than the two previous auctions which cleared at £19.40 / kWh / yr and £18.00 / kW / yr. A total of 52.4 GW of de-rated capacity secured contracts, including 4.8 GW for new or refurbished capacity. Before the auction various agendas and issues had emerged. Firstly, the government had made no secret of wanting to see more gas plant – up to 26 GW by 2030 – delivered through the auction. It also wanted a reduction in diesel engines, recognising that the significant volumes of diesel that had been successful in previous auctions undermined its decarbonisation objectives. Secondly, there had been discussion within the industry about the suitability of some of the other technologies participating in the auction, in particular interconnectors and battery storage. In relation to interconnectors, there has been speculation about whether they can genuinely deliver in a scarcity event – concerns which I have shared in a previous post about the IFA outage – and whether the de-rating factors applied will adequately reflect deliverability. The controversy surrounding storage relates to the short durations of some of the projects, which could only deliver power for periods of 30 minutes. As with previous years, over 90% of contracts went to existing plant. Gas plant was the most successful type of generation in the auction with CCGTs and OCGTs securing almost half of the contracts awarded, however, only one new CCGT was among these, Centrica’s proposed new 370 MW plant at Kings Lynn, and there was one large OCGT, a 298 MW facility at Intergen’s Spalding plant. The clearing price, while the highest so far in any of the capacity auctions, was significantly short of the £35-45 / kW / yr range expected by analysts at Barclays to be needed for new CCGTs to be built. 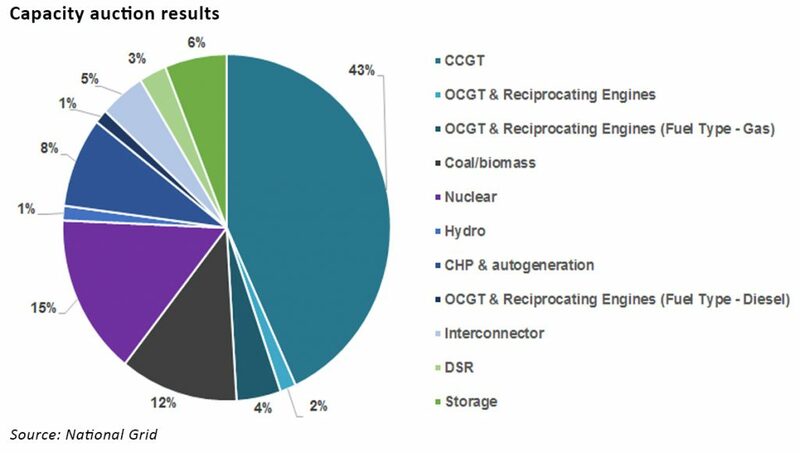 Coal and biomass plants won just over 6 GW of contracts although SSE’s 2GW Fiddler’s Ferry and EDF’s 2 GW Cottam both dropped out of the auction, raising further doubts about their future, alongside SSE’s 1.2 GW Peterhead CCGT which also failed to achieve a contract. The speed with which coal has been exiting the market is causing some concern, and the closure of these three plants would have a major impact on capacity margins. Analysis from Sandbag suggests that small-scale diesel generators were less successful than in previous auctions. Around two thirds of the diesel that initially registered withdrew before the auction started, as the proposed changes to the embedded benefits regime and mooted tightening of emissions regulations undermined their economics. 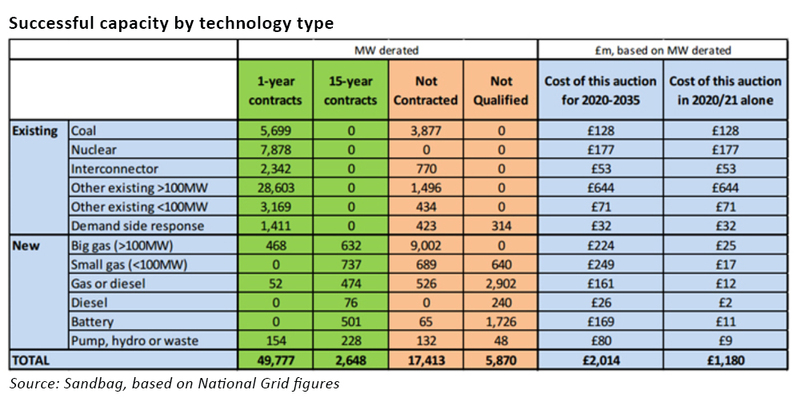 Sandbag estimates that about 76 MW of new diesel plants were awarded 15-year contracts (National Grid does not provide fuel breakdown in its report, so there is some uncertainty around the figure). 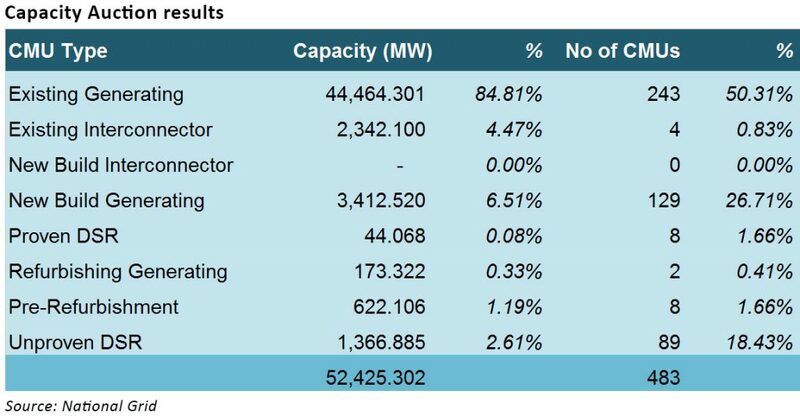 This compares with up to 4 GW that initially wanted to participate in the auction, and 650 MW which won contracts last year. 3.2 GW of contracts were awarded to storage, including 500 MW for new batteries, and DSR received 1.4 GW contracts. Existing interconnectors won contracts, but the 1 GW NEMO interconnector to Belgium, which is already under construction, was not successful. Flexible units did well but is it enough? “…the perversity of running a technology-neutral capacity market is shown by the fact it has not incentivised a slew of new large gas plants, while it is rewarding old coal plants for staying open until at least 2020. All of this indicates that if ministers really want to incentivise new gas build, they may need something different from the capacity market in its current form. This last point highlights another issue with the auction, which is that the focus on capacity ignores the need for flexibility. The de-rating methodology (the measure of expected winter availability) used to determine capacity requirements and the ability of each unit to deliver is absolutely crucial, and is as yet un-tested in a scarcity scenario. As the percentage of dispatchable capacity on the system falls, it is essential that there are enough sources of flexibility – non-intermittent supply and turndown DSR – available to ensure security of supply in periods of high demand / low renewable generation that may occur during winter high pressure weather, with sufficient margin to accommodate unexpected outages in the thermal and nuclear fleets. With 2.3 GW of contracts being awarded to interconnectors and 3.2 GW to storage including short duration batteries, there is some reason to doubt whether this balance has been reached. Confidence will be further eroded if large thermal plant closes having failed to secure contracts. The amount of new or refurbished plant delivered by the auction is lower than the amount of plant that could close having failed to win contracts. In an auction again dominated by existing plant, the higher clearing price has done little to stimulate the kind of new capacity the government wanted, while increasing the returns for existing generators. Arguably the auction has delivered poor value for money, while failing in one of its core objectives. Whether the over-riding objective of ensuring security of supply will be met remains to be seen.